The Taskmate Go from HealthPostures retrofits any standard desk to become a sit-stand workstation. The unit uses a robust, well designed clamping mechanism which securely affixes to any desk up to 2.0" thick. The height is adjusted by a single release lever and the movement is counterbalanced with a spring mechanism which raises and lowers the monitor and keyboard simultaneously. There are 10 available height options all of which are locked upon the release of the adjustment lever (unlike some units which do not have a locking option and can then "drift" downwards when the user leans on the keyboard tray). The monitor can be attached to any of 6 mounting points in the unit, providing different height adjustment settings between the keyboard tray and the middle of the monitor from a minimum of 6.5" and a maximum of 20". The Taskmate Go supports up to 35 lbs of weight, and provides a full 17.5" range of movement, resulting in the keyboard tray being cantilevered from 4" below the desk to 13.5" above the desk. The platform worksurface is 19.0" x 9.0" and the monitor mount is VESA compatible. The Large Tray is a one-piece tray which is 30" x 12". For users wanting a smaller tray with a discrete mousing area, the Swing-Out Tray has a 19" x 7.5" area for the keyboard with a separate swing-out mousing area which is closer to the user and can be reversed for right or left handed use. An optional (but not recommended) wrist rest is included with the Swing-Out Tray. Either keyboard tray model can be adjusted to a negative tilt of 5 or 10 degrees. The unit ships largely assembled (apart from the tray) which minimizes setup time. Le Taskmate Go par HealthPostures transforme (retrofits) tout bureau standard pour devenir un poste de travail d`assis-debout. Ce produit utilise un mécanisme de serrage robuste et bien conçu qui se fixe solidement à n'importe quel bureau jusqu'à 2 po d'épaisseur. La hauteur est ajustable par un seul levier de libération et le mouvement est contrebalancé avec un mécanisme à ressort qui monte et descendre le clavier et le moniteur en même temps. Il y a 12 options de hauteur qui sont toutes verrouillées lorsque le levier d`ajustement est libérer (contrairement à certaines produits qui n'ont pas d'option de verrouillage et peuvent baisser lorsque l'utilisateur s'appuie sur la tablette du clavier). Le moniteur peut être attaché à l'un des 6 points de montage de ce produit, offrant une gamme d`hauteur entre la tablette du clavier et le milieu du moniteur à partir d'un minimum de 8 po et un maximum de 18 po. Le Taskmate Go peut supporter jusqu'à 35 livres de poids et offre une gamme complète de mouvements de 18 po, ce qui permet de surplomber la tablette du clavier de 2.5 po en dessous du bureau à 13,5 po au-dessus du bureau. La surface de travail de la tablette est 19 po x 9 po et le support du moniteur est compatible avec VESA. La tablette est grande, de 30 po x 12 po. Pour les utilisateurs qui souhaitent une tablette plus petite avec une surface séparée pour la souris, la tablette pivotant a une surface de 19 po x 7,5 po pour le clavier avec une surface pour la souris pivotant séparée. Cela rapproche la souris de l'utilisateur et peut être inversée pour l'utilisation de la main droite ou de la main gauche. Un repose-poignet est inclus avec la tablette Swing-Out Tray. Les deux tablettes de clavier peuvent être ajustés à une inclinaison négative de 10 degrés. Ce produit est expédier assemblé en grande partie (à part de la tablette), ce qui minimise le temps d'installation. 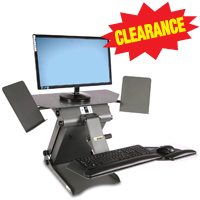 The Taskmate EZ from HealthPostures allows one to create a standing workstation on any standard desk. The unit attaches to any worksurface using a grommet mount, or the clamp mount accessory can be purchased as an alternative (suitable for desks no deeper than 24"). The Monitor and keyboard height are independently reconfigurable by physically lifting and moving the unit from one 'notch' to another, providing configuration options in 1.5" increments. The monitor can be attached to any of 14 'notches'in the unit, providing a range of height between keyboard tray and the middle of the monitor of a minimum of 13.0" and a maximum of 31.5". 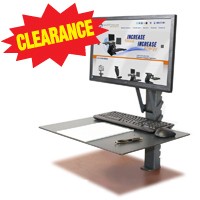 The Taskmate EZ supports up to 50 lbs of weight, and provides the ability to set the monitor (at its midpoint) from 15.0" to 33.0" above the desktop, and the worksurface 2.0" to 33.0" above the desktop. The keyboard tray can be lowered to 2.0" above the desk to 20.0" above the desk. The keyboard tray has an 18" x 23.5" area for the keyboard and mouse. The monitor mount is VESA compatible. Some assembly is required (approximately 5-10 minutes). The Taskmate Executive from HealthPostures allows one to create a sit to stand workstation on any standard desk. The unit does not need to be affixed to the worksurface, as its rugged construction and weight (50 lbs) is sufficient to provide stability through its full range of movement. The height is adjusted by a simple two way rocking button which effortlessly uses an electric motor to raise and lower the monitor and keyboard simultaneously. 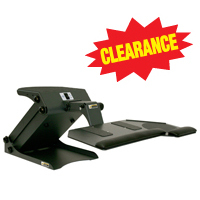 The keyboard arm mechanism provides an additional 6" of height adjustment of the keyboard tray. The Taskmate is relatively compact, with the base requiring only a 14" wide by 21"deep area on the worksurface. The keyboard tray can be cantilevered to 5" below the desk to 13" above the desk. Non slip pads for the base and Velcro are included to attach the LCD or CRT monitor to the top of the unit for added stability. The winged top platform for the monitor is 30" x 14" and two 8.5" x 11" document holders / phone holders are included and can be affixed to this surface. The keyboard tray has an 18" x 9" area for the keyboard with a separate mousing area which is closer to the user and can be reversed for right or left handed use. An optional (not recommended) wrist rest is included with the tray. The Taskmate Journey from HealthPostures allows one to create a sit to stand workstation on any standard desk. The unit does not need to be affixed to the worksurface, as its rugged construction and weight (50 lbs) is sufficient to provide stability through its full range of movement. The height is adjusted by a simple two way rocking button which effortlessly uses an electric motor to raise and lower the monitor and keyboard simultaneously. The keyboard arm mechanism provides an additional 6" of height adjustment of the keyboard tray. The Taskmate is relatively compact, with the base requiring only a 14" wide by 21"deep area on the worksurface. The keyboard tray can be cantilevered to 5" below the desk to 13" above the desk. Non slip pads for the base and Velcro are included to attach the LCD or CRT monitor to the top of the unit for added stability. The top platform for the monitor is 11.5" wide x 14" deep. The keyboard tray has an 18" x 9" area for the keyboard with a separate mousing area which is closer to the user and can be reversed for right or left handed use. An optional (not recommended) wrist rest is included with the tray. The new Stance Angle Chair from Health Postures reinterprets the industry leading concepts of their original Stance Chair. 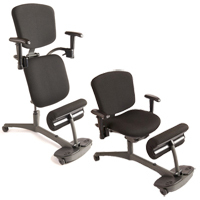 Users are once again able to enjoy the benefits of an office chair which effortlessly converts between Sitting, Kneeling and Assisted Standing. The Stance Angle Chair is the ideal seating solution for true Sit-Stand Workstations as it supplies an ergonomic "seating" solution for each style of working. Ahead of its time in addressing the requirements of the Sit-Stand working environment, the Stance has now come of age in a streamlined, more compact version—the Stance Angle. The innovative design of the Stance Angle Chair makes it an ideal companion to sit-stand workstations, enabling users to seamlessly transition between Sitting, Kneeling, Assisted Standing (Leaning) and Standing throughout their workday. The freedom to effortlessly move between different postures will encourage regular movement, a key factor in achieving a healthy active-working environment. 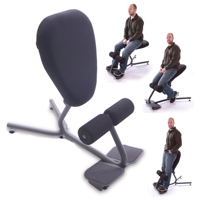 Unlike traditional seating which needs to be moved out of the way when moving from sitting to standing, the Stance Angle Chair simply moves with the user, offering a third position—"Kneeling"— which actively encourages correct spinal alignment and can aid in strengthening lower back muscles. When in the "Assisted Standing" mode the user is able to rest against the back of the Stance Angle while also reducing the load on the lower limbs and joints, further reducing overall user fatigue and contributing to a higher degree of alertness and greater productivity. The Stance Angle also features easily adjustable armrests which provide support to the arms in all three positions, reducing the risk of strain to the neck and shoulders even when standing. The ease with which the Stance Angle Chair moves between working positions removes any obstacle to users who seek to actively shift between positions throughout the day. Users can be more engaged in their work as blood flow is increased through the increased movement, and leave work less fatigued. 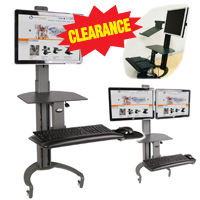 The Surface Taskmate from HealthPostures facilitates sit/stand stations for non-office, industrial use. It incorporates rugged construction and an easy-to-use, quiet mechanism. The height is adjusted by simply pressing a button. 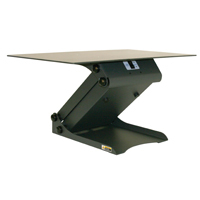 It is small enough to fit on existing workstations and can be customized with accessories so the entire workstation is completely height adjustable. It is also an excellent solution for workstations that are accessed by more than one user. The TaskMate comes fully assembled.